I realize that it has been awhile since my last post and for those that read my blog, I apologize for that. I will try to post more frequently. That being said, I hope you enjoy the following post. NOTE: I will be mentioning God and my belief in him. If this offends you then please do not read. For those of you that are parents of cleft effected children, especially those with cleft palates, there will more than likely be thoughts of “Why was I born this way?”. I know from time to time throughout my childhood and teen years I asked myself that question. I would look at my parents, my sister, and friends and to me it didn’t make sense that I was the only one who looked like I did. As a child it was very confusing, however I have been very fortunate to have family who have always told me that I am beautiful on the inside and out, therefore I never felt “ugly” or whatever other word I might have heard. My revelation of accepting my cleft/scar came around the summer of 9th grade. I was reading my Bible like I sometimes do. I don’t remember if I was reading a devotional that told me to be in the book of Psalm or if I just decided to read it because it’s my favorite book of the Bible. Regardless of the reason, I was reading Psalm 139. If you have read this particular chapter, I would suggest it to anyone. There was a few verses that stuck out to me, like an “Ah Ha” moment. 13 For you created my inmost being; you knit me together in my mother’s womb. 14 I praise you because I am fearfully and wonderfully made; your works are wonderful, I know that full well. 15 My frame was not hidden from you when I was made in the secret place, when I was woven together in the depths of the earth. 16 Your eyes saw my unformed body; all the days ordained for me were written in your book before one of them came to be. “Wow” I thought, “God knew I would have a cleft before I was born. He had a plan for me being born with a cleft. He sees me as wonderfully made!” It was at that moment I could truly accept my birth defect. I finally realized that no matter what I thought previously, I was/am beautiful to God and with that realization I finally saw myself as beautiful. If you don’t get anything out of this post, please know that your child is special and beautiful and no matter what he or she goes through, there is a purpose on why your child was born with a cleft. As I have said before, I truly believe that I was born to tell my story, to show that you can be a confident, successful, and dare I say beautiful individual. If you are a “cleftie” reading this post, you have to first accept yourself and your beauty before you can let others fully accept you. Regardless if you were born with a cleft or not and your are reading this, know that God made you in his eyes and you are BEAUTIFUL/HANDSOME! Remember you are fearfully and wonderfully made!! If you read my previous blog, you know that I went to go visit five year old Ella and her family this past weekend; I had a great time. My mom got to meet Ella and her siblings, it was a great trip for all of us. 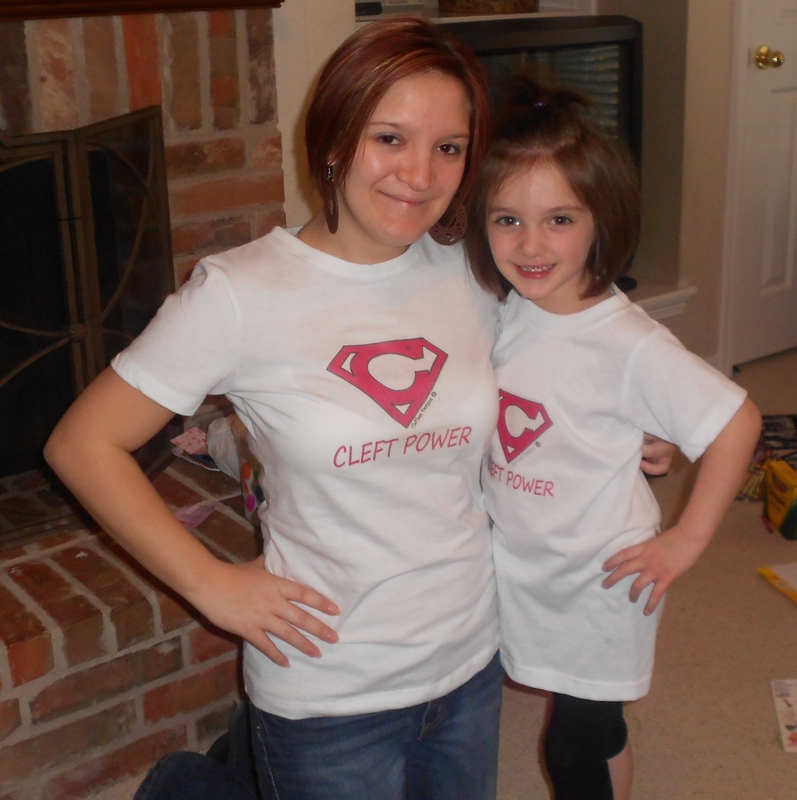 The picture above is us with shirts, iron-ons made by ClefTees Designs. You can check the designs out on their Facebook page. The dolls pictured below were made by Tiny Wide Smiles – Doll Clinic, who is also on Facebook. Ella LOVED her doll, her reaction was more than I could ask for and Melody (her doll’s name) is being loved by such a sweet little girl. I wanted to post some pictures from the trip for you all to see. Enjoy! 🙂 P.S. If you click (or double click) on on of the pictures below it will get bigger and then you can click the next arrow to see each picture after that. Me watching Ella’s reaction on seeing the doll. I got her a unilateral cleft baby doll, born like she was. Ella and her doll, Melody. So precious! One thing that I get to do this weekend is go to Texas. In Texas is a five year old little girl who was born with a unilaterl cleft lip and palate. Her mother and I “met” in the beginning/mid of 2009 on Yahoo! Cleft Chat group. Her mother is so sweet and one of my good friends now. 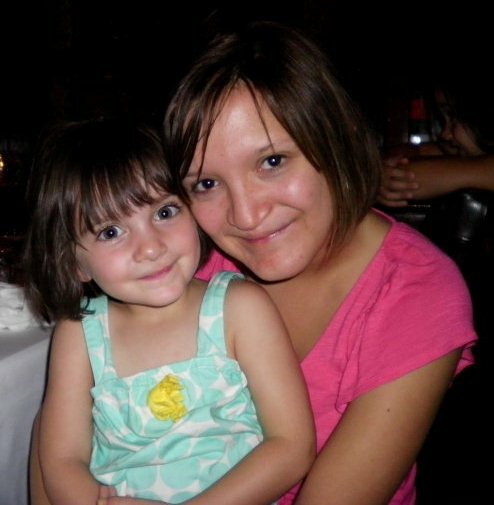 I was going to meet Tina (mom) and Ella (daughter) in summer of 2009 as I have family in Texas but things got in the way and it never happened. I could rarely reach Tina on the chat group and I thought I might never get to meet her and her precious daughter.Close to the end of April 2010, I received a friend request and message from a Tina. At first it just didn’t click, until I read her message. The two of us never knew each other’s last names, however through Facebook we had ONE mutual friend. How CRAZY/AMAZING is that? So it was set that I would meet everyone in June of 2010, and it’s been absolutely amazing since then. Ella was three at the time and I instantly became smitten with this sweet little brown haired, brown eyed girl. Not only did I instantly love her but I instantly fell in love with the whole family. I have gotten to see them all a handful of times now and this Saturday will mark another time. The first or second time I saw Ella I gave her a cleft bear from Cleft Palate Foundation. She loved it and it made my heart happy. Of course since I don’t have children yet, I love spoiling cousins and friend’s children so I usually bring something with me each time I go. Last visit in February it was going to be Ella and her sister, Audrey’s birthday so Ella got a talking Minnie Mouse doll. This time however, I’m ecstatic to be bringing a cleft doll made by Kate from Tiny Wide Smiles – Doll Clinic and a cute t-shirt from ClefTees designs by Darcie! I asked Tina if she thought Ella might like the doll and we think she is going to go crazy about it! Several years ago, I started writing poetry. One day I wrote regarding my cleft and I wanted to share the poem with you all. that pieces would not meet. The doctor’s expression tells them the outcome is unclear. Parents glad that their baby girl would live. much attenton to her they would give. Her parents knew she couldn’t be replaced. Through all of this she gained power. and uses herself as an encouragement. As a kid who was born with a cleft lip and palate, there are many things I have been through. I’ve had spacers, braces, head-gear, upon other things. There are certain moments in particular that I will never forget and looking back make me laugh. In fourth or fifth grade I had to get braces, along with that I ended up getting a spacer put up in the roof of my mouth. I was not pleased about the spacer and although I had just gotten it put in, I decided that I wanted a Burger King hamburger. The hamburger was not a good choice as it hurt to eat it, so I decided that if I can’t have the whole hamburger, I would have the pickles on the hamburger. One pickle eaten, two pickles eaten, three pickles….not eaten. The last pickle got stuck in my spacer!! This might not have been a big deal except I couldn’t get the pickle out and we were 45 minutes away from home. I was so upset, I began to cry. My parents tried to calm me down and after a bit I did calm down. I even made up a song, “I gotta pickle, I gotta pickle, I gotta pickle hey hey hey”, you know from the Little Rascals movie where the little boy sings “I gotta dollar, I gotta dollar, I gotta dollar hey hey hey”? What can I say I’m a silly girl. For those that read this blog and have a cleft or a kid with a cleft, do you have any funny stories to share?